Add a quick and easy stocking stuffer to your Christmas gift ideas this year with this beautiful Christmas nativity Hershey mini candy bar wrapper printable. It will help you bring a little bit of Christ into your home and Christmas on a busy Christmas morning. I think the hardest thing about Christmas is coming up with stocking stuffers. It's easy to spend a fortune and put more money into the stocking than in to the actual Christmas presents. So I try to find cheap and easy ways to fill the stockings up with candy and treats that I know the kids will like. 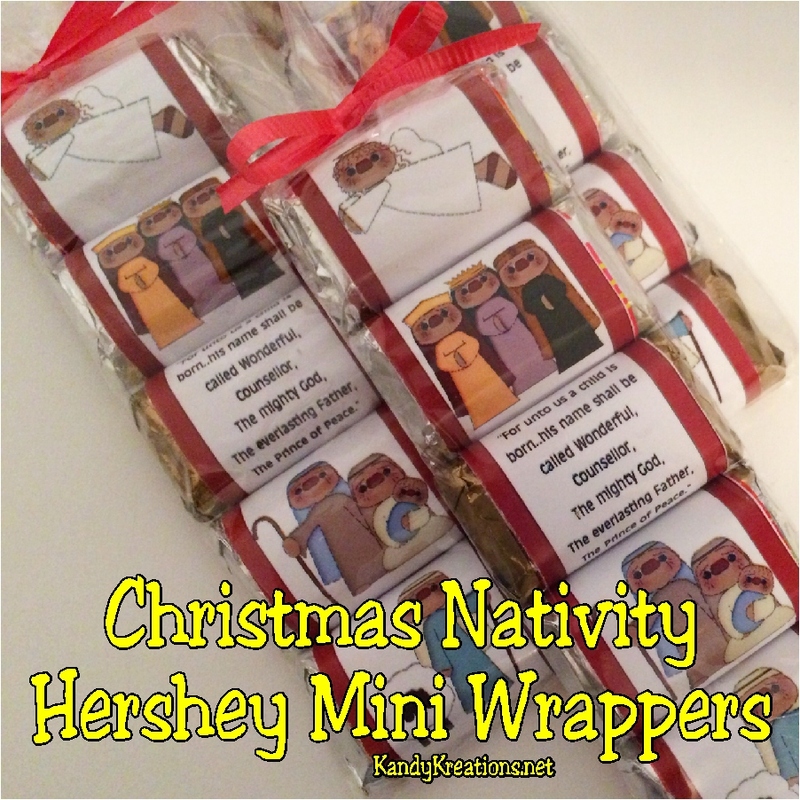 I know they all like chocolate, so it was a no brainer to make up these Christmas nativity Hershey mini wrappers. These wrappers have a cute nativity theme clip art designs on them. 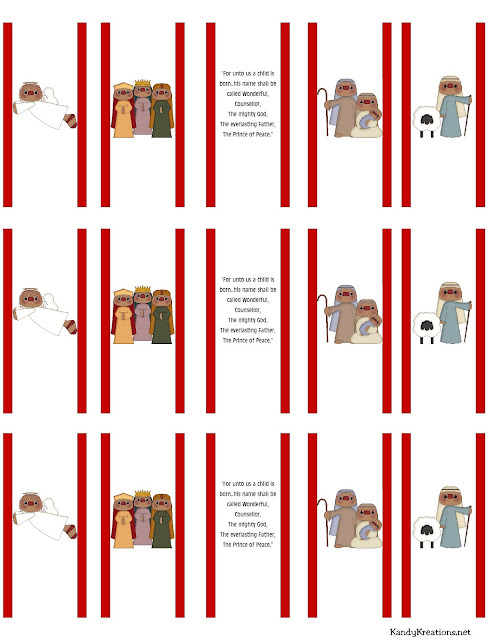 You'll find a Christmas angel, the three wise men, Mary and Joseph with baby Jesus, and a Shepherd and lamb. I just love how these guys have a raggedy feel to them. Putting these nativity characters in my kids' stockings will help them remember, if only for a moment or two, about Christ as they go through their Christmas morning. 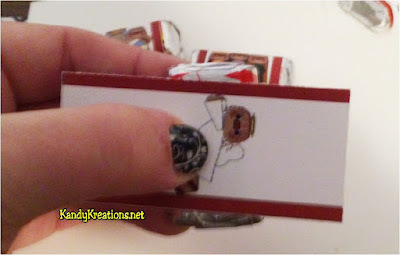 These candy bar wrappers are super simple to make. Go to the picture at the bottom of the page. Right click and save to your computer. Find the file and print it. You can print on to just about any type of paper. I really like to use photo paper, but I've also used Card stock and regular typing paper too. 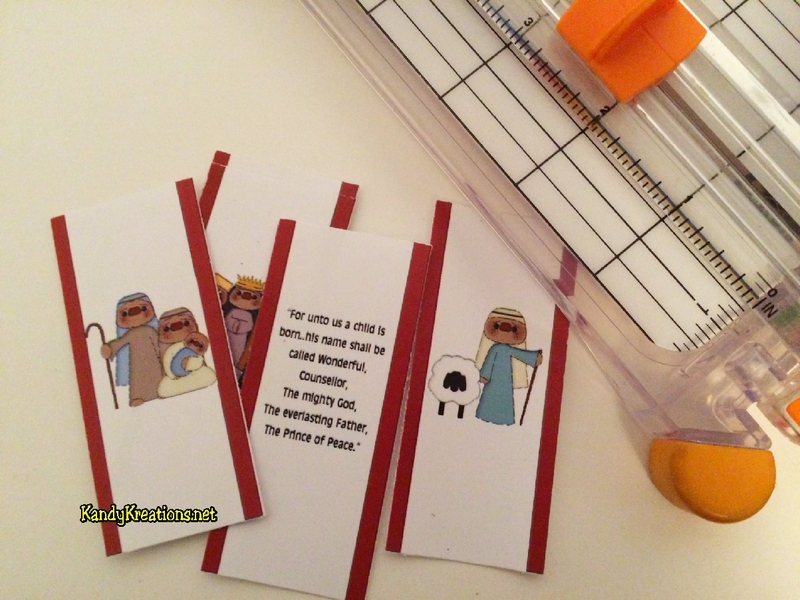 When you are printed, cut out the Nativity characters. There are 5 wrappers in each sets with three sets on each page you print. 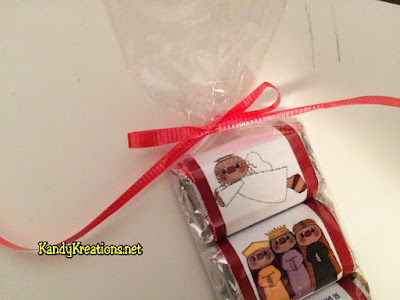 Once the candy bars are all wrapped, carefully slide them inside a pretzel bag (found at any craft store) I really like using the Wilton bags because the bars slide right in without any effort. Start with the bottom candy bar, and work your way up. Use whatever order you like, but I liked it with the scripture in the center above the Christ child. Now tie your pretzel bag off with a bow and cut off any excess of the bag. Didn't I tell you it was a super easy stocking stuffer or neighbor gift idea? Gotta love it. 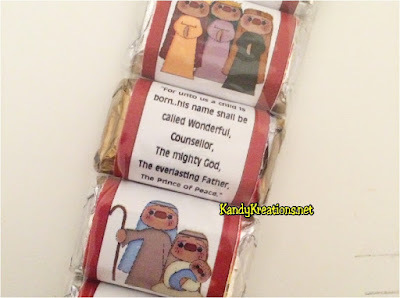 If you did, please pin the project to share with others and then check out my other Christmas mini candy bar wrapper printables available in our download shop.